Live out your DJing fantasies with Mixstation 4. 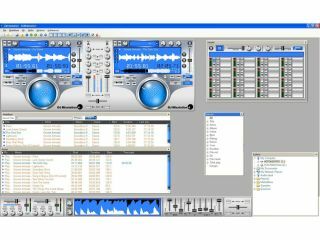 As well as music creation packages, eJay´s product line also features the DJ Mixstation software. As its name suggests, this is a DJing app, and word reaches us that version 4 is now available. The interface looks to be a pretty standard twin deck affair, and there´s automatic BPM detection, syncing and matching. You can also adjust the tempo, pitch and speed of your music manually. Your mixes can be spiced up with 15 effects, while an 8-pad sampler is onboard too. Usefully, there´s looping functionality, and you can also drop in any of the 1000 royalty-free samples. The software can also read iTunes playlists. This being an eJay product, one of the most attractive thing about DJ Mixstation 4 is its price - you can pick it up for just £30. It runs on PC and is available now. Find out more at the eJay website.